As most of us can remember that Iceland was the first country that went down during the last Global Financial Crisis in 2008. During that time Iceland had done something remarkable and that is during the five years prior to the crisis, managed to transform its economy from a fishing industry to a mega hedge fund country. Many of its citizens left their traditional trade which is fishing to become fund managers and salesman. As a result Iceland’s banking assets (physical assets + Loans + Reserves + Investment securities) grown to more than 10x its GDP of $14 billion. With such high leverage, when the financial crisis struck it is unable to defend its economy and hence its house of cards collapsed. The purpose of this article is a post-event analysis of the performance of the Icelandic economy that refuses a bailout as compared to Greece which went for a bailout with the injection of funds from Troika. To simplify matters, we shall coin the bail-in and bail-out as (BIBO) for short. Of course in the short term it helped stabilized the Greek economy for a while but we want to know to what extent it had transformed the Greek economy in the long run with the accompanying terms and conditions and austerity measures. In this article we shall compare the performance of both the economies of Iceland and Greece with the economic indicators or metrics below from the year 2002 to the present. We believed we have been fed with too much toxics by the mainstream medias which are also own by them that capitalized on the age old investment axiom of good-to-good……………………..
Don’t piss down my back and tell me it’s raining! The Big money men arranged to have the last government taken out in order to put in the new face of so called change ,Not one red cent more to the Banks, Labours way or no way! But what did we really get ?? Twiddle dumb and twiddle Dee political musical chairs as foretold by myself . One political party loses in the general election the other parties gets in ,The policies of the first party are still been carried out by Faceless Bureaucrats who owe their alliance to the people who got them their vastly overpaid salaries .All of the main political parties in Ireland are bought and paid for! Just look at my posting (Meet the real Taoiseach of Ireland “Peter Sutherland) the financiers have infected and infested Irish politics over the past 70 years and no one gets into high office in Ireland without the help from these unelected puppet masters. The political system is totally corrupt the party system is infested by people who are out to hold on to power and rule out change of any kind within the established system! This analysis continues on from my last articlein light of the recent French and Greek elections where voters rejected economic austerity in favour of money printing Inflation stealth debt default as politically an smoke and mirrors Inflationary depression is being seen as far more palatable for populations than a deflationary depression slow motion economic collapse. However to be able to print money inline with the true state of the respective competitiveness of euro-zone economies, then these countries governments have no choice but to exit the euro-zone, or be forced out as they one by one fail to follow through on agreed austerity measures. What may be lost in the noise that is the mainstream press is the fact that Greece has not been in a recession or even a depression, Greece has been in a state of slow motion economic collapse on the scale of past economic collapses such as that of Argentina but so far without the ability to default, devalue and inflate. As the below graph illustrates that following the financial crisis of 2008, Greece had been following a similar economic trend trajectory to that of most western economies including that of the UK, US and Germany, however the real crisis began in late 2009 when the economic recovery from the pit of the Great Recession of 2008-2009 evaporated and the Greek economy began a slow motion collapse that has so far seen Greek GDP in real terms contract by 16% since the 2008 peak, with no end in sight Unlike the V shape of the more regular debt default economic collapses such as that of Argentina’s of 2001 and more recently Iceland. Greece is having an “orderly” default. The taxpayers of Europe are in theory going to lend €130 billion to Greece to pay back €100 billion in Greek debt that is owed to private lenders. Greece has to pass several difficult tests in order to get the money. €100 billion of debt to private lenders will be written off. Thus the net effect will be that they owe €30 billion more. How does this help Greece, except that they get €30 billion more they cannot pay? The”new” debt is already trading in the market, even though it has not actually been issued. (Don’t bother traders with messy details, just do the deal.) This page from Bloomberg is just too delicious not to print, sent to me courtesy of Dan Greenhouse of BTIG. It shows the new Greek bonds trading at over a 71-79%discount, depending on the length of maturity. Note this is AFTER the 53% haircut already imposed. That reads to me like the market value of original Greek debt is now between 12 and 14% of the original face value. Didn’t I write in this letter early last year that Greek debt would ultimately get a 90% haircut? Let me suggest to my critics that what was pessimistic back then may prove to have been optimistic at the end of the day. So, the Greece Deal is done – at least mostly done – following riots and Parliamentary approval. What now? Austerity is killing the economy in Greece! 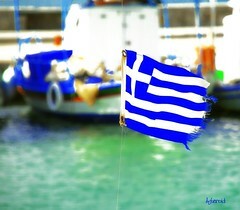 Dominant Social Theme: Greece needs to “get its act together.” But will the pain be too much to bear? Free-Market Analysis: The almost genocidal nature of modern “austerity” as interpreted by the current crop of European one-world technocrats has come in for some mild criticism in the pages of the Washington Post. Surprise! It must be really bad in Greece for this august, mainstream mouthpiece to publish such an article. Look on it as a limited hangout of sorts. With the Greek economy continuing to collapse as suicides pile up, a responsible mainstream paper must provide some sort of realistic reporting. And so it does. There is no doubt that this is the case in Ireland and the Irish Government, because of their incompetence are guilty of allowing this depression to continue longer than it should. This belligerence on their part is costing the citizens dearly. They are no more than stooges for the new landlords in Berlin .Austerity without a currency devaluation is just plain stupid! Today’s meeting between Sarkozy and Merkel is being framed in the context of continued pressures across the euro area (see report on the meeting here). More ominously – within the context of the euro area leadership duet ignoring the latests warning signs for Greece. Per Der Spiegel report, IMF has changed its analysis of the Greek rescue package agreed in July 2011 in-line with IMF changes in forecasts for Greek economy in the latest programme review in December 2011. Specifically, IMF lowered its forecast for growth from -3% to -6% GDP.